Expanded Version of Feature Published by Chattanooga CityScope in the magazine’s Fall 2013 edition. The countdown to 3:00 p.m. is once again entering the final stages as Dex and Mo begin what is for them a joyous daily walk into the main studio at US101 — Chattanooga’s top-rated radio station and one of the leading country music format stations in the nation. In just a matter of minutes, Dex and Mo know they will have another opportunity to connect with thousands of loyal radio listeners from across Chattanooga and the surrounding region. 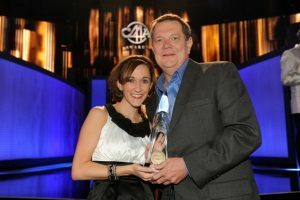 The dynamic radio duo of Dex and Mo with one of their many CMA Awards for excellence on the air. As they open the microphone on each day’s first segment, Dex and Mo are quite comfortable in the knowledge that they will be sharing a piece of their lives with an audience that has become a large group of friends and even an extended family. They also know their listeners thoroughly enjoy the fact that — in a world of impersonal automation in all levels of radio — Dex and Mo present themselves as next-door neighbors. The formula for a great radio team cannot be broken down into a simple equation. However, when you listen to two people sharing the microphone on the same show, you can usually tell within a few minutes whether or not a radio team has right chemistry for success. 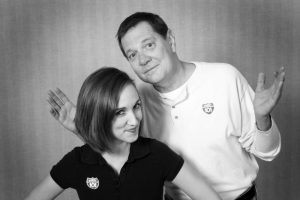 Dex and Mo are a great example of a pitch-perfect chemistry that is rooted in both radio partners understanding their roles. Dex is the sage baby boomer with 41 years of experience in radio and the music business combined, while Mo is an energetic millennial with a strong sense for organization and detail. “Everything that I am weak at doing, those are her strengths. She is the most organized person that I have ever seen in my life,” says Dex. Dex and Mo have the type of chemistry that can turn personal stories into highly entertaining radio segments. Part of that chemistry is a mutual trust between the two partners that they will lead each other in the right direction. Dex demonstrated how this trust works to a studio visitor a couple of weeks before Christmas. Just before a segment was beginning to open, Dex tells Mo, “I’ve got something on this for you.” Mo replies, “You’re not going to talk about my driving, are you?” Dex then looked over to the studio visitor with a “watch this” kind of smile. Mo opens the segment and Dex reminds her of the trip they made the night before to see a friend in the hospital with a group from the radio station. Dex knows from past experience that, even as detail-oriented as Mo is, she might not remember having to suddenly slam on her brakes in heavy traffic – a move that inadvertently rolled down Dex’s window in the front passenger seat in the process. As he tells the story, Dex quickly sees that Mo didn’t remember his window going down. By the time Dex finishes with his short story, Mo has nearly fallen out of her studio chair in laughter. The real winners in the exchange are the listeners – particularly those driving down the road amid the heavy holiday traffic. ““Mo says things because she knows where I will go with it and I do the same with her. To me, that’s chemistry,” says Dex. If you listen to Dex and Mo for just two minutes on the radio, you can immediately hear the mutual respect they hold for each other as professionals and as good friends. That sense of respect begins with the respective career paths that eventually brought them together as a team in 2009. After a brief stint in the News Department at Channel 9 following her graduation from the University of Tennessee, Melissa Turner, who goes by the nickname Mo on the air, saw an opening as a Traffic Reporter for US101 in 2005. Mo’s work ethic and her ability to build trust with the listeners captured the attention of many long-time radio veterans at US101. Dex, whose radio career began in the early 1970s, was one of those to make note of Mo’s dedication and her passion for radio. Dex with his Country Music Hall of Fame Award. 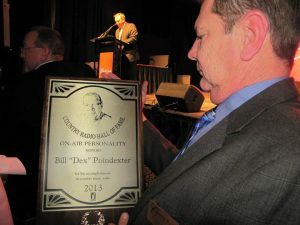 Even from an early age, Bill Poindexter, who shortened his on-air name to Dex, has always held a strong connection to both country music and the radio. As the youngest of five kids who lost his father to a fatal car accident when Dex was just five years old, Dex recalls his family gathering around the radio in their Rossville home on Saturday nights in the late ‘50s and early ‘60s to listen to the Grand Ole Opry. The beginning of Dex’s radio career was also filled with good fortune. Through an introduction by a friend who worked as a deejay at WFLI, Dex got the opportunity to watch and then sit in for the overnight deejay at the leading Top 40 station in the market. When asked about the craziest experience in his radio career, Dex did not hesitate for an answer, and he shared his first moments on the air. “The first time I got on the air was about the craziest thing that happened in my career. I was in high school, and my friend, Jimmy Byrd, was doing afternoons on WFLI,” recalls Dex. “He was in high school and it was the biggest radio station in town. I mean, he was on the legendary Jet-Fli! Dex met the late-night deejay and Dex carefully watched him do his show – cueing up records on the turntables, organizing the commercials and, of course, opening up the microphone to chat with the listeners. On the third overnight visit to the WFLI, Dex got his first moment to shine on the radio. Dex recalls: “The guy turned to me and said, ‘Do you want to take over?’ And I said, ‘Are you kidding?’ He said, ‘There ain’t nobody listening.’ Now that was crazy because people were listening to Jet-Fli around the clock. But I went on the air and I had never been on the air in my life. Just 16 at the time, Dex used the experience at WFLI to secure a job with a small acid rock station in Rossville before eventually returning to WFLI as one its full-time personalities. Working for 10 years with some of entertainment’s top acts as a promotions executive with RCA Records, Dex gained invaluable connections and experience. The musical acts that Dex worked with included Jefferson Starship, Hall & Oates, Jimmy Buffet, Waylon Jennings and Dolly Parton. During this period of his career, Dex found that he still had a strong connection to country music and its artists. Dex also discovered that his appreciation for radio had grown even deeper. Burned out on the record business, Dex called a friend at US101 and he was able to get his foot back in the radio door in 1993 with a position in the engineering department, handling US101’s live remotes. David Earl Hughes, one of US101’s most popular personalities, built a strong rapport Dex, and Hughes asked Dex to serve as his partner during his afternoon drive show. When Hughes left Chattanooga to work at the legendary WSM in Nashville shortly before his untimely death in 2004, Dex began working with a series of partners before teaming with Mo in 2009. Throughout all the changes in his career, Dex has consistently shown the ability to connect with people on a personal level. To both his audience and music industry professionals, Dex is a friend on the other end of the microphone. A multiple winner of awards from the Academy of Country Music and the Country Music Association as well as a Marconi Award recipient, it was not surprising that Dex was a 2013 inductee into the County Music On-Air Personality Hall of Fame. While Dex’s Hall of Fame induction marked a high point in his life, his spotlight moment at the ceremony came just weeks after suffering the greatest loss of life. Just days after learning he would be a part of the Hall of Fame, Dex was at home with his wife, Shelia. It was three days before Christmas 2012 when Shelia suffered a brain aneurism. Dex watched as his childhood sweetheart and wife of 41 years passed away in a matter of minutes. In need of support, Dex found strength from Mo, the US101 staff and management and his loyal listeners. Mo actually had a tremendous sense of what Dex was experiencing. Having lost her mother at very young age, Mo knew the extent of the support Dex would need and she called on her father to share his experience with Dex. In his Hall of Fame induction speech, Dex made special note of Mo and how she their partnership on the air had helped to re-energize his career. He then took a moment to honor Shelia, recalling that one of the last text messages he had received from her. It was a reply about how proud she was of Dex upon learning the news that he would be inducted into the Hall of Fame. “Tears were running down my face the entire time,” recalls Mo. “It was just an emotional night for all of us. We were excited to see Dex to get that honor, but there was definitely this big hole in all of hearts that night. It was a bitter-sweet kind of night for us. No matter how numerous awards nor how great the ratings success, Dex and Mo have stayed focused on meeting the needs of their audience and the community. Ask them to name the greatest source of pride from their work and they will likely first mention the audience response to the station’s annual fund-raising for St. Jude’s Children’s Hospital as well as other charities. US101 listeners contributed nearly $500,000 to St. Jude’s in 2013. The fact that Dex and Mo share their lives on a daily basis and work to reflect the happenings in their community may be the ultimate key to their continuing success.